We use the information you provide about yourself for correspondence only. We do not share this information with outside parties except to the extent necessary to complete that order. 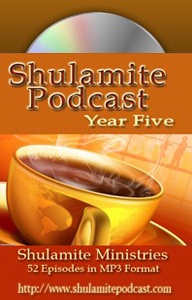 The personal information we collect about you on our website, ShulamitePodcast.com, is strictly limited to the information you provide us when you comment, contact us, or sign up for an mailing list. Should you have other questions or concerns about these privacy policies, please call us at 678-648-9672 or send us an email at info@shulamitepodcast.com.